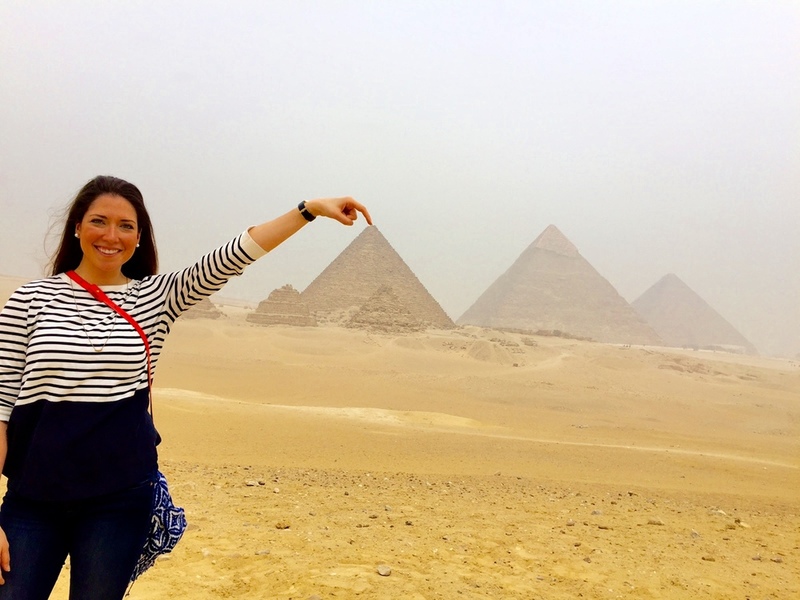 The Great Pyramids of Giza... THE PYRAMIDS!!! I wish I could go back in time and talk to my 3rd grade self, learning about these unbelievable structures... and say "just wait Michelle... one day you will be standing in front of them, you will TOUCH them, and you will ride camels around them!" HA! who would have thought? There is no way to ever put this into words... I could have stared at them forever. And on our last day when we were taking our last glimpse before getting into the car to the airport, it literally hurt to say goodbye knowing we'd probably never see them again. 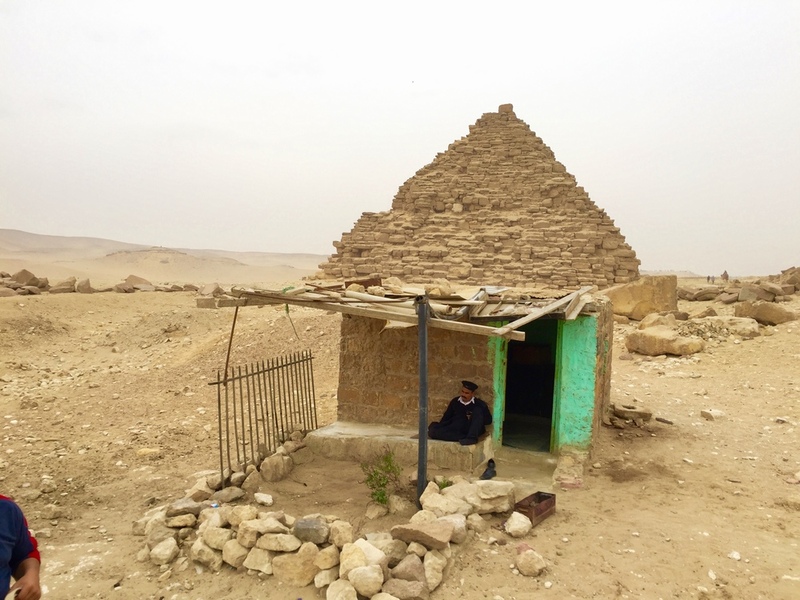 The Great Pyramid of Giza (or the Pyramid of Khufu or Pyramid of Cheops) is the oldest and largest of the three pyramids in the Giza pyramid complex. It is the oldest of the Seven Wonders of the Ancient World, and the only one to remain largely intact. Its believed to have been built over a 10 - 20 year period finishing in 2560 BC. 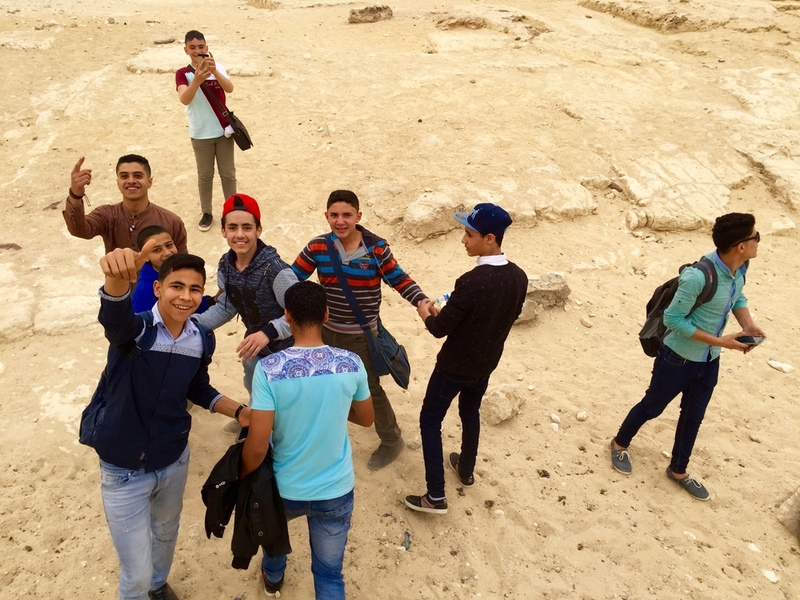 The day started with a quick history lesson from Ahmed and then we were off to meet our camels and learn more history while we were riding around the pyramids. They were SO CUTE!!! I'll admit, getting up on one for the first time is a bit scary, they do it so oddly - standing up with their back legs and then their front - so you really have to hold on! And once your up, you feel SO high. But then after some time, you get really comfortable with them. Although Andrew would yell at me to hold on every time I took a picture. 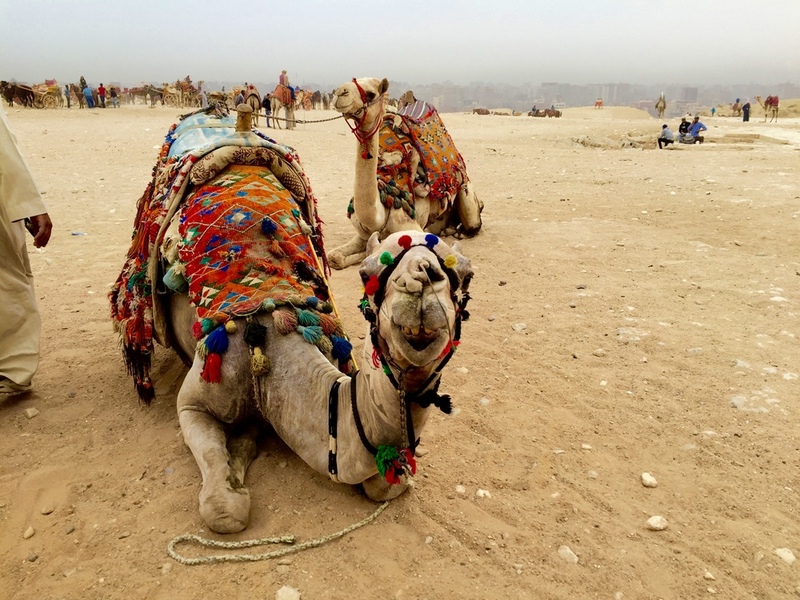 It was a nice slow and steady pace around the pyramids on our adorable camels. Every once and a while we would run into some young kids, and they would ask if they could take our picture. Our tour guide explained that a lot of the kids coming to visit these sites are from smaller towns outside the city, and they rarely see people who look like us. They are also learning english (and are quite good!) so they liked practicing on us. 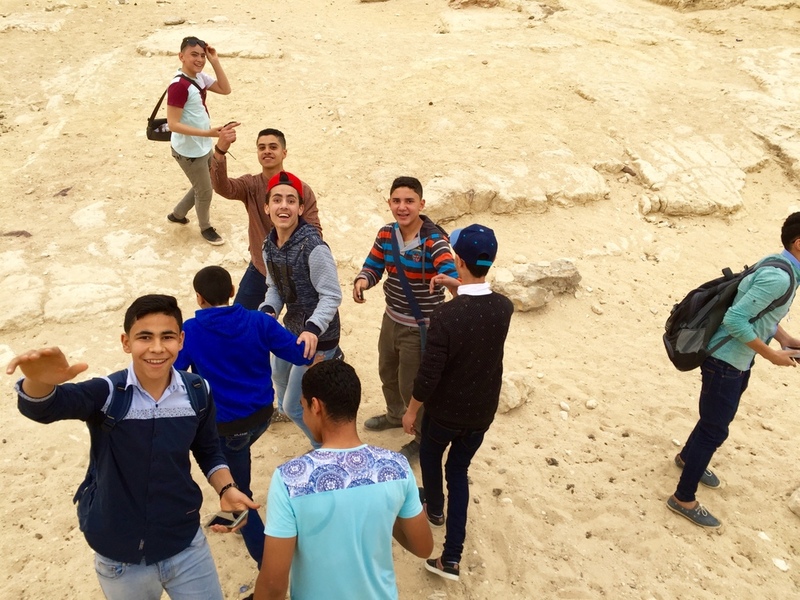 We made our way to the the third of the larger pyramids, and this is where we were allowed to go down into one of the burial chambers, or so we thought. It turns out the lights inside the burial chamber were broken, the men told us "you can go down... if you want?" We thought, well we have flashlights on our iPhones! And we'll never be here again to experience this, so lets do it! We have to go down even further? But, we made it out alive! (if you can tell in the picture we still have the look of panic on our faces as we literally sprinted up the stairs at the end) And we'll have that memory for the rest of our lives. 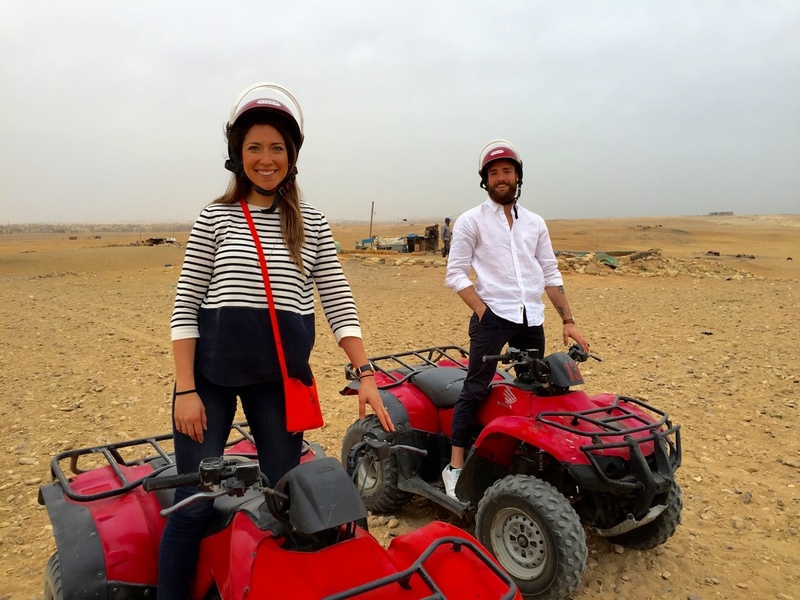 We got back onto the camels, and we rode deeper into the desert. 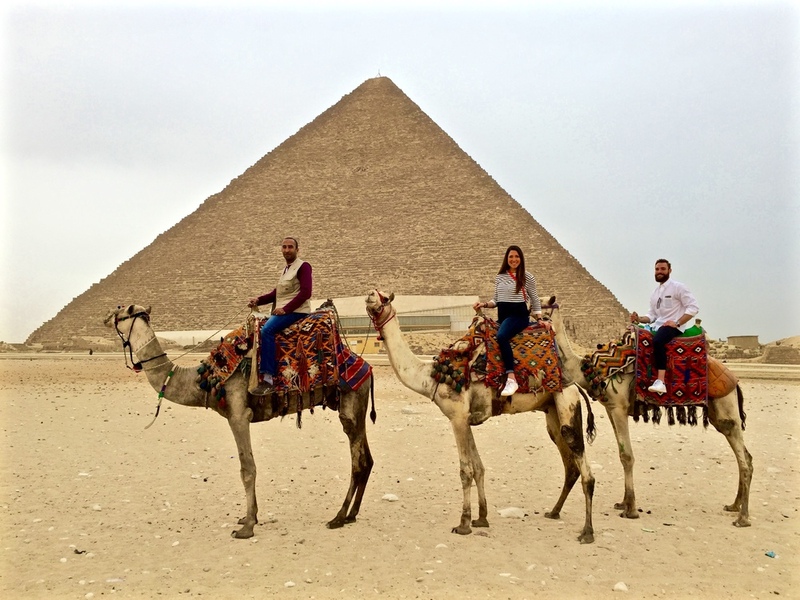 When you turn back and see the pyramids while you're riding on the camel, you literally feel like you are living in a different time period. And then we were back on the camels for some more riding in the desert. I seriously fell in love with riding camels, I wished we could have taken them home. 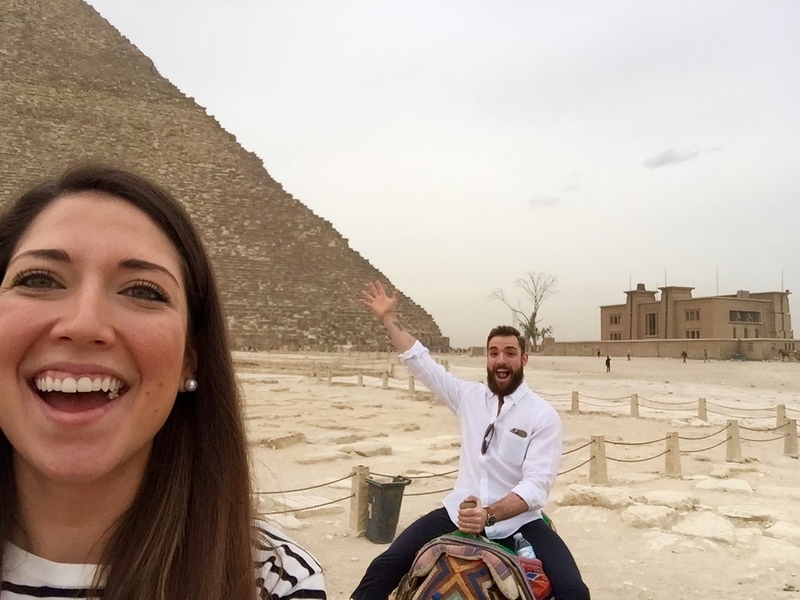 We ended our tour at the Great Sphinx of Giza and had to say goodbye to Pepsi & Charlie Brown (our camels). 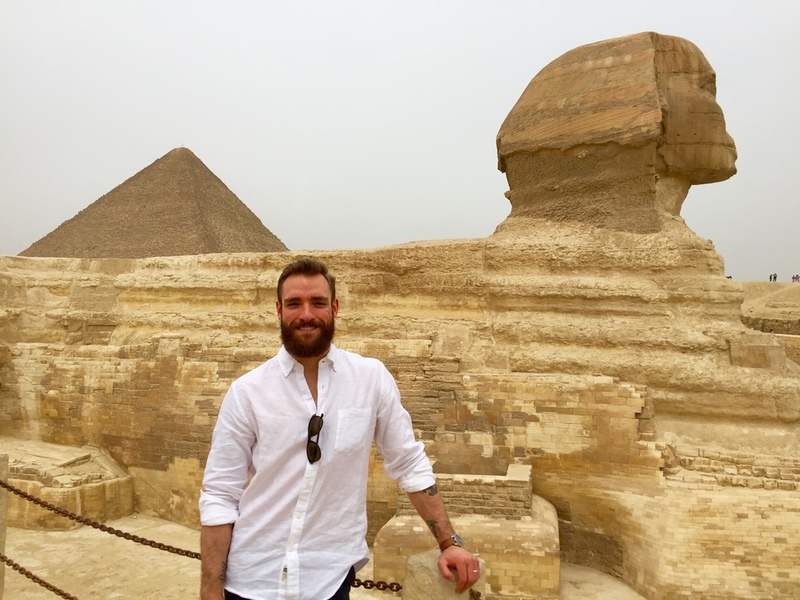 The Sphinx is a limestone statue of a "sphinx" (a mythical creature with a lions body & a human head), and it sits on the Giza Plateau. It was carved out of one piece of limestone which makes it the largest monolith statue in the world. After our camel riding adventure, we figured... why stop there? This trip was a pre-birthday gift for Andrew. I figured it would be amazing to cross something like this off of the bucket list before he hits the big 3-0. Which is why we also added some dune buggy riding in the desert, what guy doesn't want that for their birthday?? What an adventure filled day! !